Grammy nominated JC Hopkins and his Biggish Band has been tearing up the NYC jazz scene for over a decade. They have backed such great vocalists as Norah Jones and Elvis Costello. Their new album, “MEET ME AT MINTON’S” showcases outstanding performances by legendary vocalists JON HENDRICKS, ANDY BEY plus rising stars BRIANNA THOMAS, JAZZMEIA HORN, ALICIA OLATUJA, SOLOMON HICKS, CHARLES TURNER and QUEEN ESTHER. Their ongoing residency at Minton’s is one of the great jazz attractions in the city. 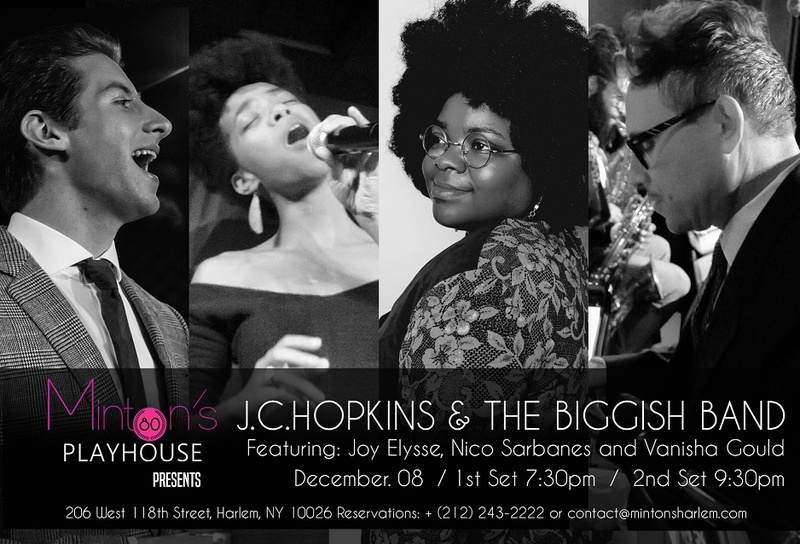 C. Hopkins Biggish Band Led by the bandleader, songwriter and producer for which it’s named, the J.C. Hopkins Biggish Band has always been a friend to vocalists, and in this engagement, the group pays a centenary tribute to Billie Holiday. Among the many singers assembled are Brianna Thomas, Charenee Wade, Charles Turner and Jazzmeia Horn. At Minton’s, you’re part of the choir. There’s this part in “Moanin'” where—not in the original version but in this one, arranged by JC Hopkins and which his band, JC Hopkins’ Biggish Band, plays—the horn section shouts out, call-and-response style. This night, we get in on it, too. Bum be de BOMP. HEY! Be dop bop be da BOMP. HEY! Bum be de BOMP. HEY! And it’s not anger any longer, but joy. “But Minton’s, reopened in 2013, was full and thriving in the current boom, and the house band that night was JC Hopkins’ Biggish Band. Like the Vanguard, there is a sense of history in this room; unlike the Vanguard, it serves food and is a rather shiny reincarnation of the original Playhouse. It is a small club, taking just 25 customers in the bar area at the back and 50 dining guests at tables in front of the minuscule bandstand. Just before taking his band on stage, Hopkins told me that the success of the new Minton’s was down to the “interaction between older cats and younger cats”. That applies not just to the audience, but to the musicians who play here — from 93-year-old Jon Hendricks to 19-year-old Solomon Hicks, the Harlem kid who has been lead guitarist of the Cotton Club band since he was 13. The birthplace of bebop, Minton’s on 118th Street, has been reborn as a venue that is as classy as it is historic. The long-neglected room has now been remodeled into one of the most attractive venues in the city, with a menu that puts most Midtown clubs to shame. The combination of pianist-bandleader JC Hopkins and vocalist Queen Esther expertly recapture the vitality and energy of Harlem jazz and blues of 70 years ago without slavishly imitating anyone and are thus a perfect fit, and they should help the relaunched room attract the attention of dancers as well as diners.